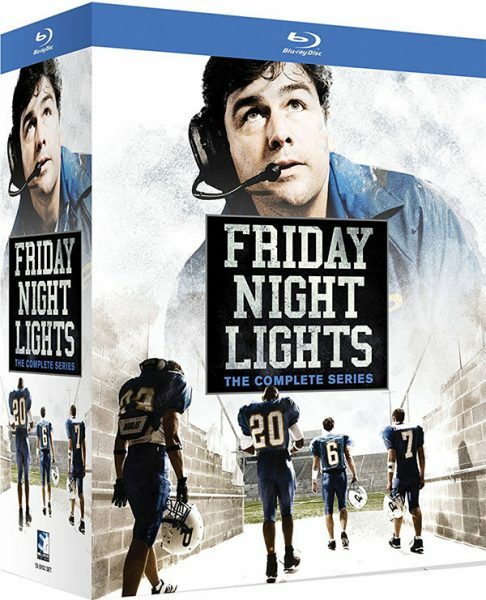 Friday Night Lights: The Complete Series will release to a 13-disc Blu-ray Boxed Set on September 12, 2017. With a total runtime of 3,313 minutes (over 55 hours), the edition from Mill Creek Entertainment will include all five seasons of the popular show that ran on NBC from 2006 through 2011. This is the first time the television series will be available on high definition Blu-ray Disc, which will be formatted for Region A playback. A release of all seasons in a DVD boxed set will coincide with the BD edition. Synopsis: Coach Eric Taylor is the newest hire at a small town high school in Dillon, Texas. After a series of events leading to his release, Taylor is forced to build a football team from the ground up at the rival high school. His wife Tami, high school principal, faces scrutiny of her own as she takes constant blame from angry parents. But even through the hardships at work, challenges at home with teen daughter Julie, and endless drama, only one thing matters: Friday night. Friday Night Lights: The Complete Series carries an MSRP of $99.99, but is currently available to pre-order for $56.44 from Amazon (see below). The DVD edition is list-priced at $69.99, with pre-orders selling for $39.51. Next Next post: Why Won’t Sony Support Console Cross-Play?